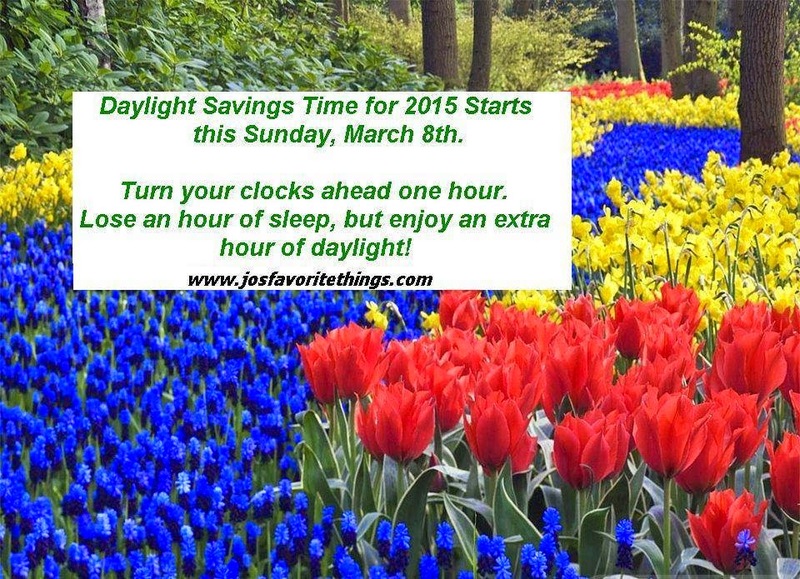 Jo's Favorite Things: Daylight Savings Time Starts This Sunday, March 8, 2015! Daylight Savings Time Starts This Sunday, March 8, 2015! This article has been updated for Daylight Savings Time 2018 HERE. Finally! This long, miserable winter may....just may.. be over. And Daylight Savings Time in 2015 starts Sunday, March 8th! One less hour of sleep that night, but one more hour of sunlight Sunday evening. Enjoy! Turn your clocks FORWARD Saturday night, March 7th, before you go to bed. Spring ahead! !